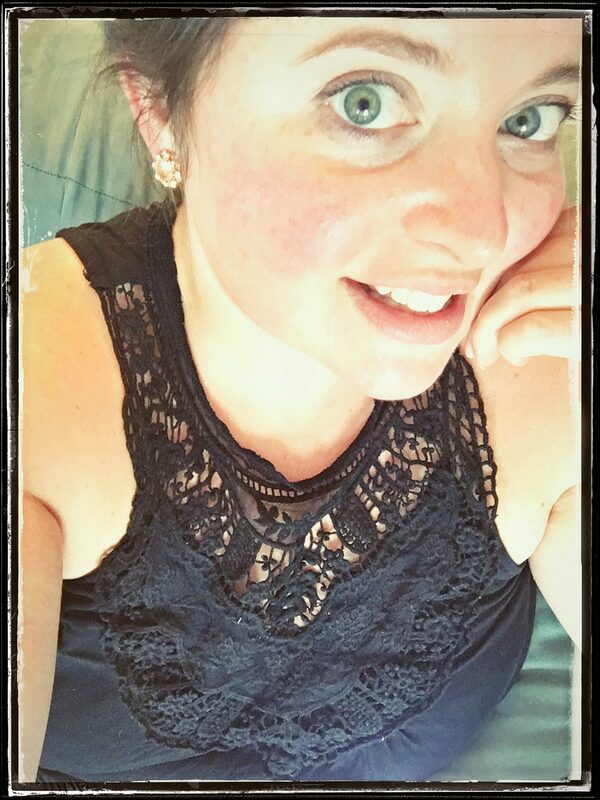 I made Instant Pot Cilantro Jalapeno Hummus for a guest post I did over at sofabfood.com recently. Inadvertently, I forgot to cool the chick peas before blending them and it reminded me how much I LOVE warm Hummus. 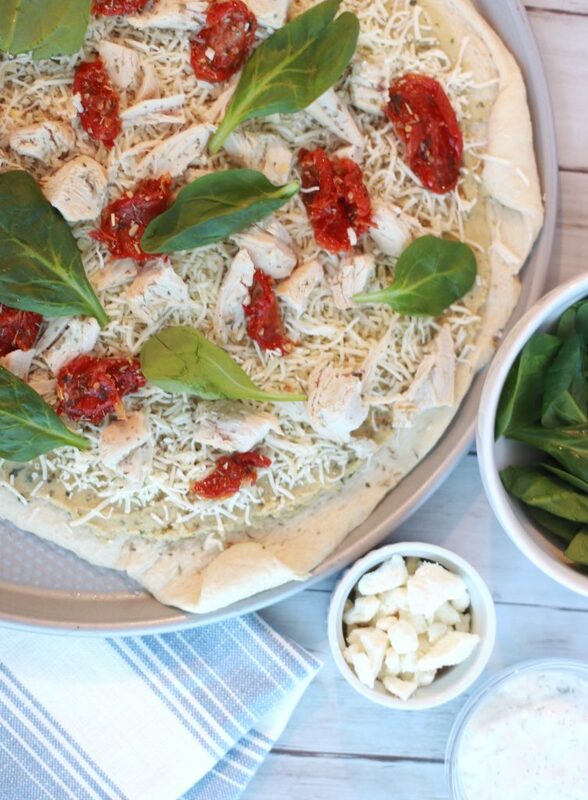 So much so, I was inspired to make this Mediterranean Chicken Pizza. 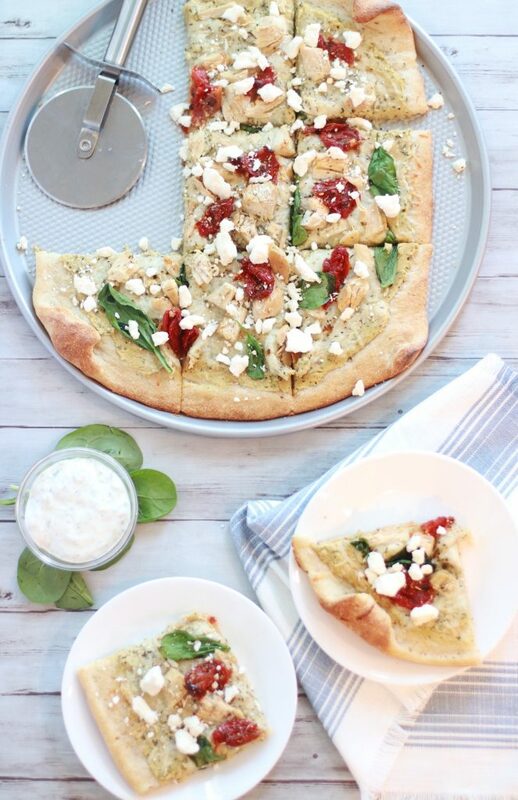 This Pizza uses the Cilantro Jalapeno Hummus as it’s ‘sauce’ layer! I also wanted to make this an easy recipe. The kind of recipe you can appreciate when you’ve already been going all day long. So, for this pizza I’m using store bought pizza dough found in the refrigerated aisle at your local grocery store. I’m also using a rotisserie chicken to save even more time and energy. Preheat your oven to 375 degrees. Spray a pizza pan with non stick cooking spray. 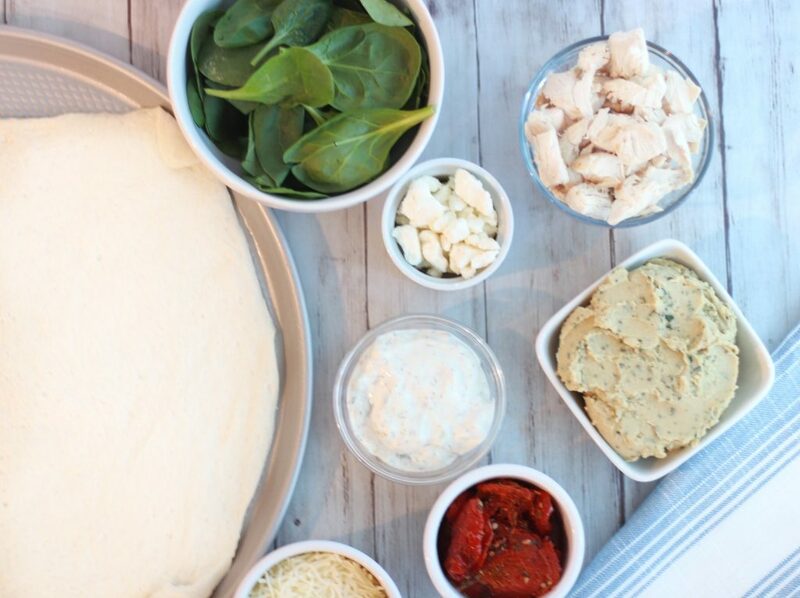 Lay out your pizza dough right on the pizza tray. 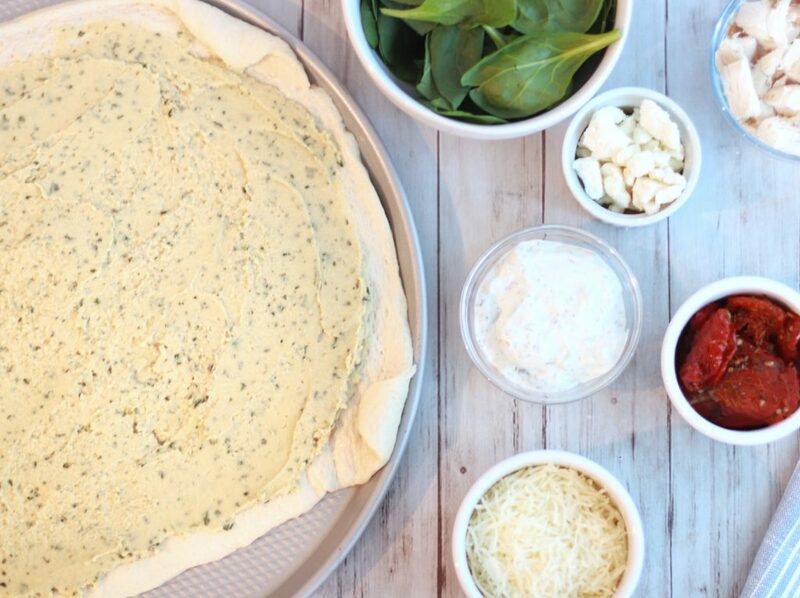 Next, spread your Cilantro Jalapeno Hummus on top of the dough. This will be your ‘sauce’ layer. Now top it with shredded mozzarella cheese and your chopped chicken. Finally, add the sun dried tomatoes and spinach. Place the pizza in the oven and bake it for about 6 minutes. When the timer is up rotate your pan. Set the timer for an additional 6-8 minutes. It’s done when the crust is a nice golden brown and all of the cheese is melted! Once you remove the pizza from the oven, let it cool. 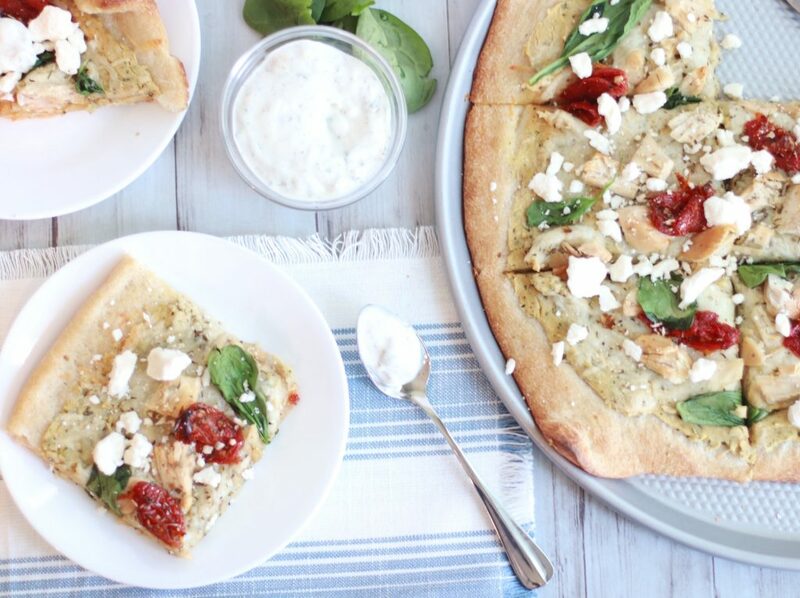 Slice the pizza and top it with Crumbled Feta Cheese. I also served mine with a side of Tzatziki Sauce, great for dipping! Spray pizza pan with non stick cooking spray. Lay out pizza dough on to pizza tray. 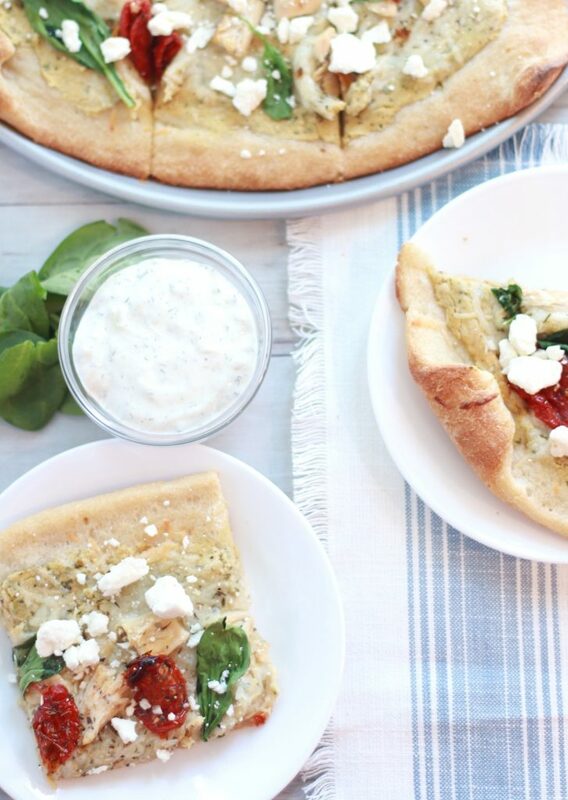 Spread Cilantro Jalapeno Hummus on top of the dough in a thin layer. Top it with shredded mozzarella cheese and your chopped chicken. Place sun dried tomatoes and spinach on top. Place pizza in oven and bake for about 6 minutes. Rotate your pan. Set the timer for an additional 6-8 minutes. It's done when the crust is a nice golden brown and all of the cheese is melted!